Check the neck? If you’re doing so routinely, especially if you lack worrisome symptoms or haven’t had past problems, please reconsider: Regular thyroid cancer screenings received a “D” grade from a blue-ribbon panel of experts. The exams can cause more harm than good, says the U.S. Preventive Services Task Force, which does periodic, evidence-based reviews of common medical screens. Its most recent review finds cause for concern that doctors and hospitals, pushed by a prominent patient advocacy group that Big Pharma’s helping to underwrite, keep recommending and subjecting patients to unneeded thyroid cancer screens. The screens, with ultrasound and physician exams, too often lead to more tests, and then to painful, invasive, and costly procedures. Doctors worldwide are detecting thyroid cancer at increasing rates, with the found incidences going up by 5 percent annually in this country. 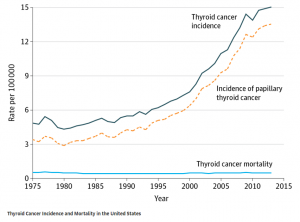 But at the same time, the relatively small numbers of thyroid cancer deaths haven’t budged. They’re neither rising nor falling. (See the diagram). Instead, doctors in thyroid screenings may be finding small growths that won’t affect patients’ well-being, though they too often lead to biopsies and to surgeries to remove the thyroid, the USPSTF says. Once the butterfly-shaped neck gland is taken out, however, patients then face a lifetime of taking drugs to replace thyroid-generated hormones produces that regulate every aspect of the metabolism, from the heart rate to the speed at which calories get burned in the body. Thyroid removal has become a common surgery, with 72,000 procedures performed in 2011, at a rough cost of $5,000 to $6,000 per surgery. Patients undergo the surgery, not just for cancer but also due to problems with hormonal imbalances. But U.S. experts, who long have been concerned about over-testing and over-diagnosis of thyroid cancer (including because of flurries of hype, such as occurred after a Japanese nuclear mishap), renewed their considerations of this screening partly due to data from South Korea. There, thyroid cancer has “become the most common cancer … more common than breast, colon and lung cancer,” researchers have found. 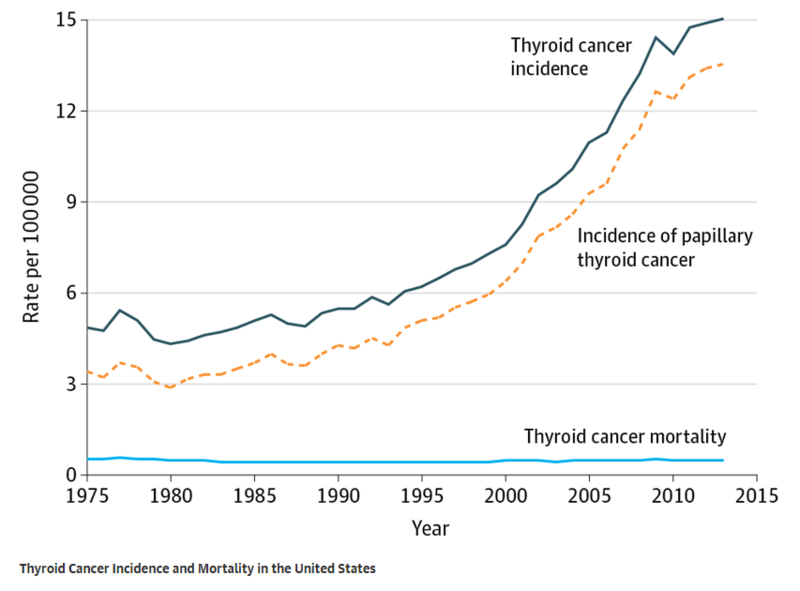 That’s partly because of the Koreans extensive use of ultrasound for screenings, as well as hype by the media and the medical establishment there about thyroid cancer risks and “lives saved” by surgery. South Korea promotes itself as a medical tourism destination for thyroid cancer care. In the United States, over-testing, over-diagnosis, and over-treatment adds billions of dollars in unneeded costs to our bill for medical care. The preventive services task force deserves praise for its independent study and its efforts to reduce and eliminate unneeded, wasteful procedures. But the group’s experts, in presenting their thyroid screening results, have noted that their evidence-based work has come under increasing fire, notably from the Republican-dominated Congress. Some lawmakers have sought to rein in the USPSTF, notably its criticism of routine prostate and breast cancer screenings for older, asymptomatic Americans. Critics want the panel studying screenings to include more clinicians from the affected areas, as well as, wait for it, representation from medical device makers (such as those, for example, who hawk ultrasound equipment used for thyroid screening). C’mon, Congress, this isn’t helpful at all. The USPSTF has won respect for its fair, careful, and thorough work. Medical specialists have and can disagree with its recommendations, and they have done so through their national practice organizations. As for special interest groups like Big Pharma or medical device makers or the like, where’s the evidence that the prestigious, USPSTF volunteers have turned away any pertinent, valuable data they have submitted? In my practice, I see the harms that patients suffer while seeking medical services. I also see the struggles we all share in paying for ever-soaring medical costs. Thyroid procedures can be uncomfortable, post-surgical treatments (hormone replacements) can last a lifetime, and the aggregate cost of this medical service adds up fast. No medical procedure, alas, is risk free, and for safety and cost reasons, it just makes common sense that we reduce screenings and treatments that increase the risks of or inflict actual harms.